The Frugal Burqueño: 7 Days of Sandals Contest ! 7 Days of Sandals Contest ! 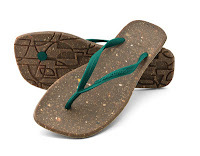 I have just won a pair of stylish and eco-friendly Amazonas Sandals! There is still enough time for you to enter and win one pair for yourself! Head over to GalTime.com and check out their 7 Days of Sandals Contest! Enter your information and tweet a given phrase for a chance to win! A new winner is picked each day for seven days. My tip - enter every day! Twitter contests are so much fun! I have already chosen my pair of Amazonas Sandals :-) Thank you very much! Fingers crossed for you!